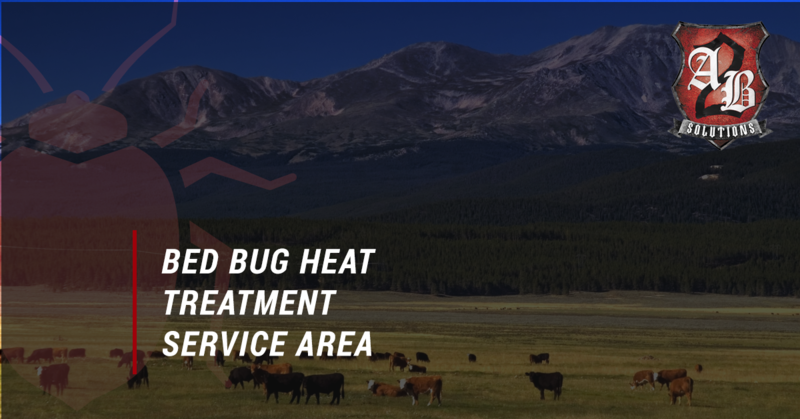 A2B Solutions is the Top Rated Local® bed bug heat treatment in Northern Colorado and Southern Wyoming and it shows in the quality of our service. As a locally owned and operated bed bug removal company, we are committed to providing efficient and effective bed bug removal services to our community. As we have grown as a company, we have continued expanding our service area which now includes locations in and around Boulder/Longmont, Cheyenne, Denver, Estes Park, Fort Collins, Greeley, and Laramie. Our team of bed bug exterminators can come to your home, business, or organization to perform a free bed bug inspection and estimate, so that we can get rid of your bed bug infestation once and for all. You may be wondering what exactly a bed bug heat treatment is, and with good reason. What sets A2B Solutions apart from other bed bug removal companies is that we use eco-friendly heat treatments instead of harsh, unreliable chemical treatments. In fact, our bed bug treatment method is so effective that it completely eliminates bed bugs, and without posing any health and safety risks to families, pets, and the environment. We use clean-burning propane or electric heat to penetrate the walls, furniture, and other areas where these unwanted pests reside. Visit our FAQs page to learn more about our effective bed bug heat treatment services. You can also visit our Debugging Bed Bug Myths page to learn about the truth about bed bugs, how they spread, and their favorite hiding places, and more. How Do Bed Bug Heat Treatments Work? As we mentioned, we use clean-burning propane or electric heat to safely and completely eliminate bed bugs from your home or business. To do this, we place heat sensors in the walls of your home to ensure temperatures within these spaces reach the kill point of 130 degrees. While bed bugs die instantly when temperatures reach 122 degrees, we raise the temperatures in your home to 145 degrees, ensuring that these nasty critters won’t escape the heat. The heat reaches your furniture, too, killing any bugs living in the folds and creases of upholstered furniture, in shelves and closets, and other areas where they love to hide. By using our bed bug heat treatment, we are able to offer a 100 percent guarantee on all bed bug removal services for one year or we will re-treat your home for free. Require less preparation – Visit our page to view our bed bug preparation guide. Are completed in one day – One treatment takes about 8-12 hours total. Have a greater kill rate – Our method kills bed bugs in all stages from egg to adult. Are more effective – Bed bugs can’t escape the heat and there’s no such thing as a heat-resistant bed bug! Are safer for humans, pets, and the environment – We only use heat rather than harmful chemicals. View our recent blog post to learn more about why bed bug heat treatments are better than chemical treatments. We back our 100 percent effective bed bug heat treatments with friendly, courteous, and reliable customer service. Each member of our team is wholly dedicated to providing efficient bed bug removal treatment so that you can get back to living comfortably in your home. We understand that a bed bug infestation can cause stress, and make those living with bed bugs feel uncomfortable, threatened, and embarrassed of their situation; however, we’re here to let you know that bed bug infestations are extremely common in Colorado and Wyoming, and there is no need to feel ashamed. For one reason, you have us on your side, and we are committed to completely removing those unwelcome pests from your home for good. Our main goal is to restore your comfort levels, give you the security you deserve from living bed bug-free, and give you peace of mind that those bed bugs won’t be invading your home again. Visit our About Us page to learn more about us and the members on our team. Whether you’re a homeowner who has a bed bug problem, or a business owner with a bed bug infestation, you can count on A2B Solutions to eliminate your bed bug problem for good! We promise to provide each and every client with a free and honest inspection and estimate for our bed bug heat treatments. If you’re ready to take back your home or business, call A2B Solutions, the Top Rated Local® bed bug heat treatment team, today for a free inspection and free service estimate.